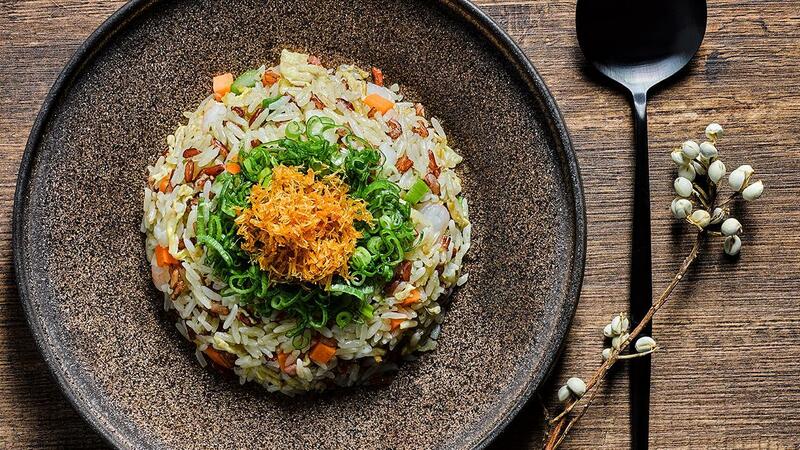 Transform leftover rice into an innovative dish that combines the best of East and West. This pesto-infused blend of seafood, asparagus, carrots, spring onion and scallop will surely have your family lining up for seconds for this comforting classic. Oil-blanch all ingredients – grouper fish, shrimps, scallops, asparagus, carrots – separately in wok. Drain well and set aside for later use. Heat up oil in wok, stir fry egg till fragrant. Add in white and brown rice. Toss well. Add in seafood, vegetables, Chicken Seasoning Powder, Pesto Herb Paste. Toss till fragrant. Transfer rice to plate. Garnish with crispy scallop and spring onion.